The home of free pretty printables! FREE Printable 2018 Planner: 25 Amazing Organizers! It’s the time of the year that we start looking around for a free printable 2018 planner. I have a great news for you– the prettiest yearly planner ever released here in Home Printables blog can be yours today! I am so excited for the release of this planner because I find it darling, refreshing, practical, functional and so easy to use. I am guessing– you’ll love it as much as I do! It’s actually my first time to release this edition of the planner hence the excitement is mounting up to this day that I am finally showing you my work. Since last month, I’ve been thinking hard conceptualizing the design of my free printable 2018 planner edition. So I scoured the net and I thought I wanted something different. I wanted to create planners that come pretty and happy– hence I finally came up with a concrete vision of the planner and its name. Friends, I am beyond thrilled to finally introduce to you this beautiful planner that I have been working on— The Free Printable 2018 Happy Life Planner by Home Printables Blog! This is the planner that you’re looking for should you be needing a free printable 2018 planner to use that is clean, functional and pretty. The planning pages included will help you plan an awesome year ahead. Join me as I show you some of the planner pages. Keep scrolling down for the unveil!!! “Everyone deserves a happy life.” That has been my guiding light in creating the pages of this free printable 2018 planner that I am about to share. For this planner then, expect to see pages that are carefully laid out, bursting with happy colors– all created to help you enjoy life! 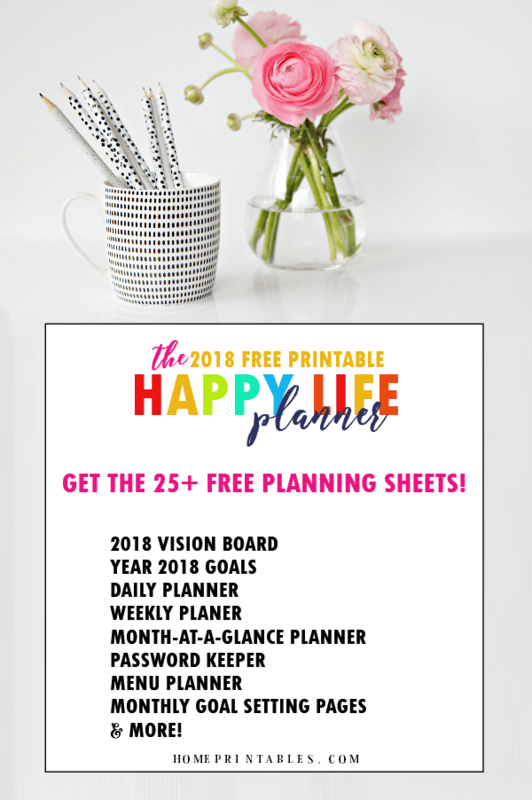 The 2018 Happy Life Planners has over 25 sheets of life organizing printables that you can use to plan your 2018 blissfully. Each page is created to be printed in standard, letter-sized paper. So what are the pretty planning pages included? This free 2018 planner comes in 3 cover designs for you to choose from, two of them are shown below. Pick the cover that reflects your personality. The first one comes clean and pretty (my favorite of them all!) and it is adorned with pretty roselite watercolor painting by OpiaDesigns. The second one, on the other hand, comes in watercolor splatter in hues of purple, beige and blue. Here, have a look at the designs. Tell me, which one are you planning to use? Now the next pages that I am going to show you are the planning pages included in the planner. As you can see, the designs come playful and colorful, carefully crafted to ignite happiness all through the year. Here is the Vision Board. How do you like drawing your dreams for the year in this page? Well, if you don’t like to sketch it, you may cut out pictures of how you would like your 2018 to look like from magazines. Thinking of reorganizing your workplace? Buying a new car? Moving to a new home? Start envisioning the year ahead, friends! 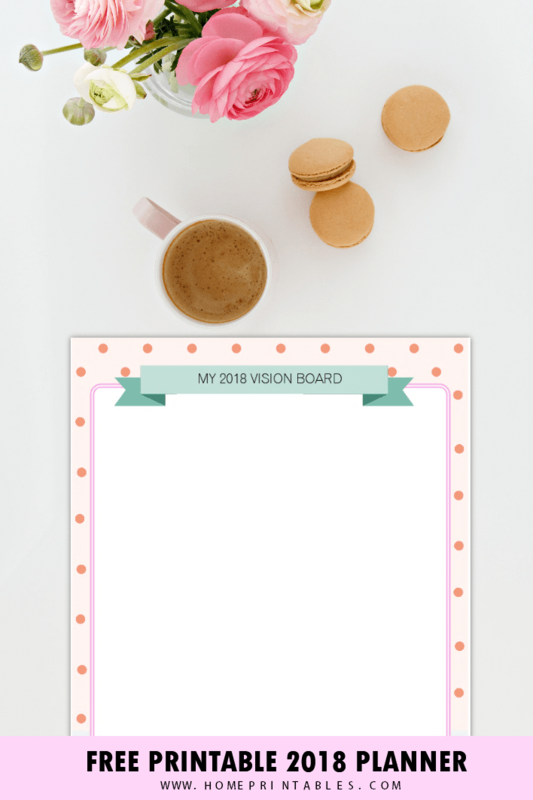 Start creating your vision board for 2018! Let’s move on to the next page. This next planner is going to be (for sure) one of the most-used pages of your free printable 2018 planner– the weekly planner. I intentionally divide your planning box per day into three should you like to map out your plans into categories such as morning, afternoon or evening (Feel free to create your own category. As for me, I would label them this way– Kids, Home, Blog. How about you?) Since I know that this page will be printed over and over, I made sure it’s less on ink. I have also included amazing month-at-a glance pages such as this one. 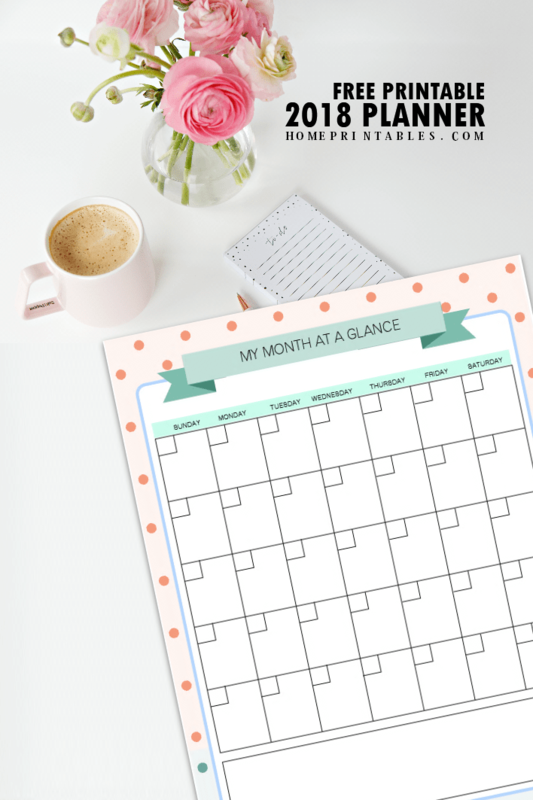 Now you can neatly organize your plans on a monthly basis using the pretty page I have for you! This page is not dated so you can use it for all the months of year. Well of course, you will also be getting a bundle of goal setting planners for all months of the year! I really love these pages because they keep me focused on a monthly basis. With them, I am reminded with the goals I have to achieve for the month which I break down into action plans in my weekly planning pages. Do you think you can use the goals setting pages, too? The sample page is shown below. All these, and so much more. Yup! 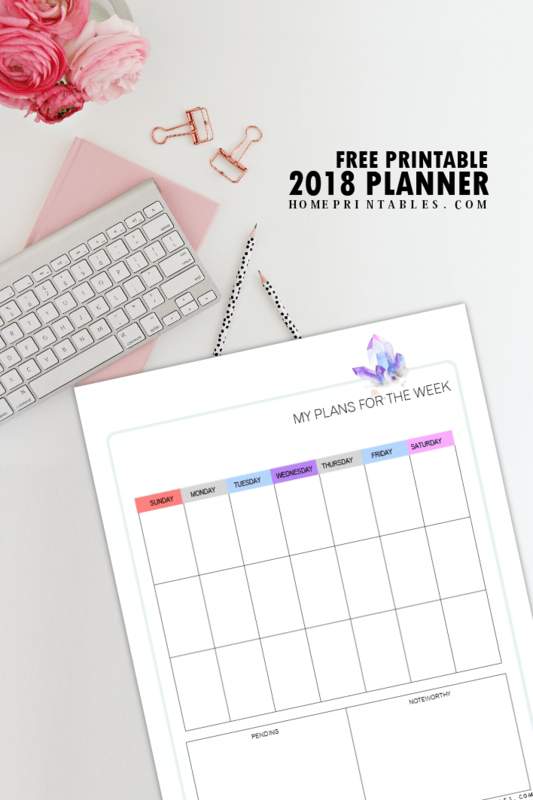 As I have said, this free printable 2018 planner has over 25 planning pages that you can all use. Ready to grab your free copy? Simply sign up for Home Printables’ newsletter HERE to enjoy the planner. I’ll send your free copy right away and the planner is definitely FREE for personal use! And oh, if you’re looking for more free planning pages to help you plan your 2018, you may also check this post as it has lovely planning pages to offer! I have a little announcement to make before ending this post. An ultimate 2018 planner has been recently released at Shining Mom blog– the 2018 Success Designer. If you dream to achieve your goals right now, you have to see this new product released on the blog covering all the worksheets that will help you succeeded. Start your journey to success HERE. Would love to see this post in the future again? Save it for yourself by pinning it on Pinterest and for others to see it, too! My dream for this planner is to reach thousands of you. Help the Home Printables family spread this freebie! What are the other planning pages you wish I included in this planner? Please let me know at the Comments, who knows, I might be able to include them in my next post. I wish you prosperity and happiness. Have an amazing year ahead! Did you include Address page? I’m thankful with you, it’s what I was looking for! Can’t explain the happiness I’m feeling. Greetings from Mexico. Something seems to be wrong with the newsletter signup page. Hi, it’s a Convertkit issue. I think it’s fixed. Please try again. Thank you. Hi thank you this is perfect – a fun calendar! Hello, There! Welcome to our little home online. The Home Printables Family is truly delighted to have you! Come explore, this little abode is loaded with free pretty printables for yourself and your family! Blank Calendar 2019: Free Editable Template in Microsoft Word! FREE Printable 2019 Planner: 30+ Amazing Life Organizers! FREE 2019 Calendar Printable & Weekly Planner: Super Cute! 30+ Amazing Free Superhero Party Printables! Would you like to share something from the blog? We're honored! As you do, please keep in mind that all text, photos and images (unless duly credited) are created for the Home Printables Blog. Should you like to share any of them, please shoot us an email first. Also, all photos and images must be credited and linked to the original post and you are not to remove any watermarks, crop, or edit any of our work! Pinning Home Printables' images over Pinterest is always loved! Thank you!